Chico the Perdiguero de Burgos at 4 years old—"Chico is a loving dog. We got him when he was a year old and the past three years have been so enjoyable for us. :)"
The Perdiguero de Burgos has a lot of skin and is not as heavily built as it looks. The extra skin comes from its close relationship with the Sabueso Español. It has muscular shoulders and a deep and broad chest. It has a large, square-shaped head and a moderately defined stop. The muzzle is long, very broad and square shaped. The long, wide, high-set, soft ears hang down in folds. It has hanging flews and a dewlap. The coat is short and dense and the coloring is always liver and white, which can include or exclude patches and ticking. Most Perdigueros de Burgos have very heavy ticking, giving an almost grizzled appearance. The Perdiguero de Burgos was used to hunt deer for most of its history. Today it is mainly used as a pointer and retriever of small, fast game such as hare, quail and partridge. Its excellent nose could fairly qualify it as a scenthound and it is known for not giving up on a scent. It is a much faster and more athletic dog than it looks and is able to easily clamber over rough and hilly terrain and to master steep slopes. At the same time, like other gun dogs, this is a very obedient animal if it has a firm, but calm, confident and consistent pack leader who provides the proper amount of mental and physical exercise and who sets the rules of the home and sticks to them. Easy to train. It swims well and works in the water. It is a very patient dog with children and other dogs and is very eager to please its master, as befits its gun dog status. Exercise is of paramount importance for these tireless, energetic animals. They are more than a match for even the most active family and they should not be taken on as family pets unless they can be guaranteed plenty of vigorous exercise, including a daily, brisk, long walk or jog. While out on the walk the dog must be made to heel beside or behind the person holding the lead, as in a dog's mind the leader leads the way, and that leader needs to be the human. If under-exercised, this breed can become restless and destructive. The smooth coat of the Perdiguero de Burgos is very easy to groom. Just brush regularly with a firm bristle brush and bathe only when necessary. A rub with a piece of toweling or chamois will leave the coat gleaming. Check the feet also, especially after the dog has been exercising or working. Dry the dog thoroughly after hunting to prevent chilling. Examine the ears regularly. This breed is an average shedder. The Iberian Peninsula is the likely place of origin for many of Europe's pointing breeds. The Perdiguero de Burgos, or Spanish Pointer, is a large pointer that has contributed greatly to the development of other pointer breeds, particularly the larger ones, such as the Large French Pointer, but also more medium sized ones as well. It has been around at least since the 1500s and is thought to be a descendent of the Perdiguero Navarro (Old Spanish Pointer) and Spain's scenthound breed, the Sabueso Español. Today the Perdiguero de Burgos is actually smaller and lighter built than it once was, because Spanish breeders have made great efforts to refine and hone its fine qualities as a bird-hunting dog. 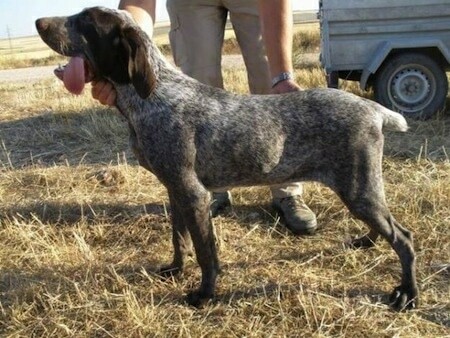 This breed was headed for extinction in the early part of the 20th century, but today its popularity is growing rapidly in Spain and hunters are rediscovering its many positive qualities.